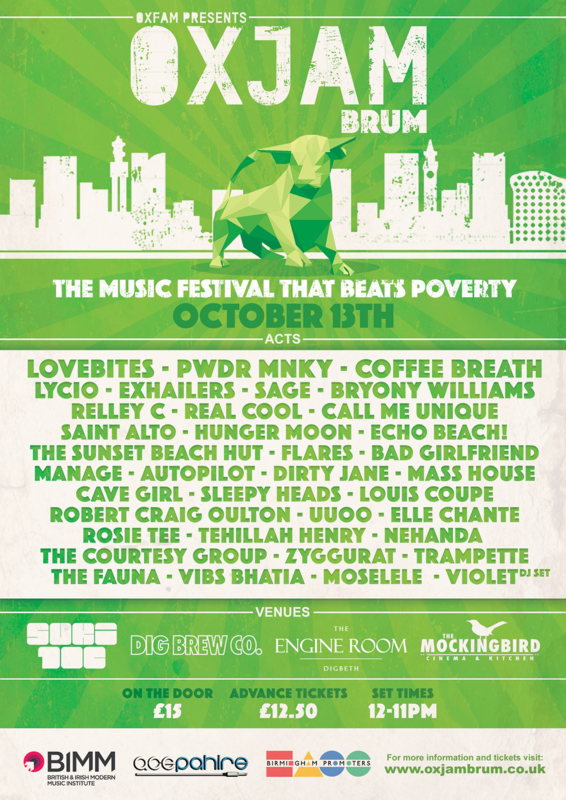 Oxjam are music festivals that give back, organised by volunteers with a deep and powerful love for music and Oxfam themselves it's a great cause to be a part of and it's wonderful to see something like this hitting Digbeth in Birmingham on the 13th October! What Oxjam does as well is give back to the music community as they hold their one day festival across 5 venues in which there's a plethora of unsigned and new musical talent on show. This years Oxjam festival in Birmingham will be holding gigs at the 100% eco club Suki10c, new brewery and taproom Dig Brew Co, quirky industrial space The Engine Room and The Mockingbird with live music in both the bar area and inside the cinema. Within these beautiful little venues will be live performances from immense brum talent such as Bryony Williams, Sunset Beach Hut, Real Cool, Bad Girlfriend, Love Bites and much much more. When asked, Adam Pyzer, festival manager, said: “Oxjam Brum is going to be an unforgettable day of live music. 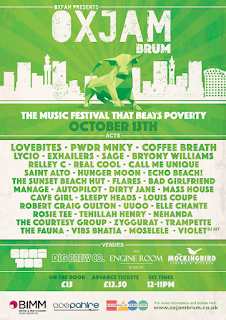 We have handpicked an incredible lineup with the best talent from Birmingham and with all the profits going to such a worthy cause, you won’t want to miss out.” And he's not lying it's going to be a brilliant day across the venues and inside the magnificent little Digbeth area. It's going to be a long and magnificent day, see you there?